Biointerface science operates at the interface between biology, chemistry, and physics, both figuratively and literally. In the figurative sense of a biointerface, neither physical nor life sciences possess the tools necessary for analyzing and understanding the behavior of biomolecules on or near surfaces. The literal interface in biointerface is between biomolecules and surfaces, which turns out to be a no-man's-land of sorts, because most of the familiar processes are modified in this environment. Nanostructures and biomolecules both operate at the nanoscale so it is natural to look for ways of beneficially combining the advantages of nanotechnology and biotechnology. Biointerface science is, therefore, intimately involved in the development of nanobiotechnology. An important step in this direction was the invention of a DNA microarray—a small metal, glass, or silicon chip covered with patterns of short single-stranded DNA. These "DNA chips" are revolutionizing biotechnology, allowing scientists to identify and count many DNA sequences simultaneously. DNA microarrays are the enabling technology for genomic-based medicine and are a critical component in advanced medical diagnostics. Like digital chips, DNA chips are parallel, accurate, fast, and small. These advantages, however, can only be realized if the fragile biomolecules survive the attachment process intact. Furthermore, biomolecules must be properly oriented to perform their biological function. In other words, the DNA strands on these chips literally must stand up to be counted. 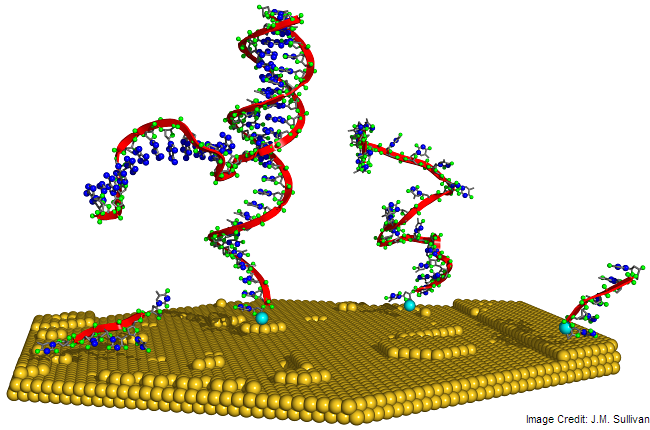 Schematic of DNA molecules attached to a gold surface. Differences in overall structure and orientation are emphasized by color-coding of DNA structural elements: phosphate backbone (red), nitrogen (blue), oxygen (green), and sulfur linker (cyan). Upright orientation is required for efficient hybridization with a complementary strand from solution. Image by J. M. Sullivan. Just as their electronic counterparts, each generation of DNA chips is expected to be smaller and/or more densely-packed than the previous one, so it is important to develop techniques that can study interactions between biomolecules and surfaces on progressively smaller scale. The shrinking scale means that traditional methods used by molecular biologists are no longer sensitive enough to analyze, for example, individual "pixels" on a DNA chip. Surface analysis methods have been developed specifically to study thin films and small surface structures, so they are well-matched to the requirements for biointerface analysis in terms of the spatial resolution and sensitivity. Most surface analysis techniques, however, only operate under ultra-high vacuum conditions, while biomolecules can properly function only in salty aqueous solutions. There are ongoing efforts to close this environmental gap. In the short term, it appears to be possible to gain useful insight even from studying biomolecules on surfaces under vacuum, because some of the relevant structural information is still preserved in such samples. But in the long term, either existing or new surface analysis techniques will need to be adapted to work in humid and, eventually, in aqueous environments.